Depending on how you skate and distribute your body weight over the skate, the wheels may wear unevenly. In this case, for prolonged longevity you can rotate the wheels around the frame to spread the wear. 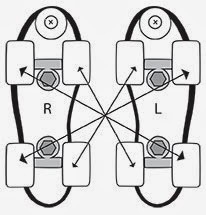 To do this, undo the axles and swap the front right wheel of the right skate to the back left of the left skate, and so on. By changing the wheels diagonally, you get more use out of them before you need to buy new ones. The less worn areas will now be on the areas that you put more pressure on. Dont forget, Rio Roller replacement wheels are available. Check out our Dealers page or ask your stockist for more info. Re-tighten the axles after changing over the wheels.